Seven weeks to go till the London Marathon, and my training plan had suggested a half-marathon race, and somehow that got turned into a short holiday to Cyprus. 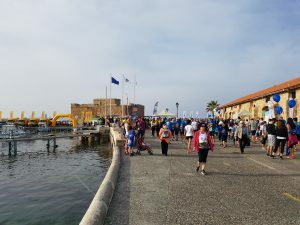 It was an early start on Sunday morning to get to the Cyprus half in Paphos by 7.40. I was able to use a loo in the car park, which was a good move as there were long queues down near the start. I had my second banana of the morning, topped up water, and then headed down to the harbour. The start and finish were by the castle at the harbour, and though very familiar to me, still a great spot. 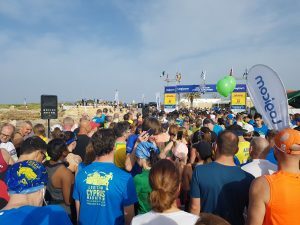 The marathon runners had started at Aphrodite’s Rock at 7.30, but the start area for the rest of us was a little busy with HM, 10k and 5k runners all milling about together, but absent any instructions I headed as close as I could get to the start line, which proved a sensible move. 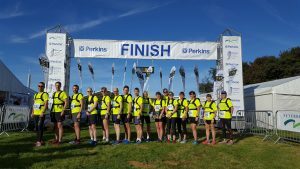 The temperature was unseasonably warm, being 19 when we set off – I’m not sure what it was later in the race but it reached 26 later in the day. I wasn’t sure how fast I should run in the warmth and took it a little easy to start, and chose to adopt my run/walk strategy once again – run for a mile, then walk for about 40 seconds. I used this to set my personal bests at 10 miles and half-marathon, though on long training runs where the pace is lower, I stick to pure running. Not only does the short walk break, if adopted right from the very beginning, allow the legs to recover before they get too tired, and thus achieve a faster average pace than continuous running, it also makes drinking and eating gels or other foods much easier (even more so in races where the drink is in a cup rather than a bottle), but by being fairly regimented about the structure, it stops the temptation to walk for too long or too often. Lucy and my parents had driven out to a roundabout on the course, which thanks to the doubling back of the route, meant that with virtually no movement they were at the 5km, 9km and 16km points, which meant for good support and also the opportunity to be refuelled twice: I deliberately timed my walk breaks to be as I passed them at 5 and 16 kilometres. After reaching the high point, 60 metres above sea level, after 12.5km, I realised I wasn’t far off PB pace and was feeling good, so pushed myself quite hard, skipping the walk break at mile 8 as it was downhill, and having one at about mile 11½ instead of 11 and 12, and really trying to push the pace. 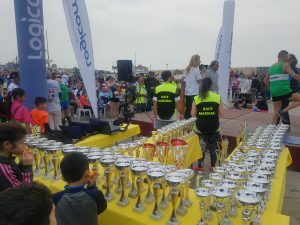 It is amazing how a trivial upwards slope of less than 1% still feels vertiginous towards the end of a race – I’d never noticed that the coastal road past the hotels is fractionally uphill, but now I did as I fought to gain a few extra seconds. I found I couldn’t quite make up the missing time, though, despite finishing with a 4:24/km sprint which passed a few people, with shouts of support from friends coming as I neared the line. 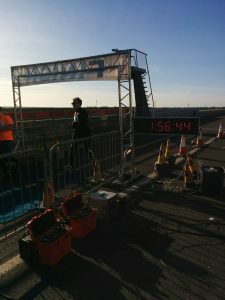 I finished 13 seconds off my target, in 1:56:19. However, I subsequently realised that my PB was 1:56:26, not :06, and so it was a new PB by 7 seconds which is fabulous, and makes that sprint finish doubly worthwhile. My last three halfs have all been within 7 seconds of each other, so good consistency too. A really satisfying result in the heat. 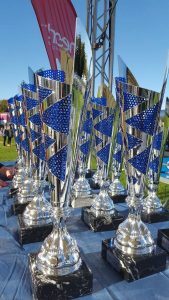 I stopped to recover for a few minutes, and admired the astonishing array of trophies for the various age categories. A great morning, and more marathon nutrition practice too. As a practice run for London, as an event in its own right, and as something to experience with family and friends, a success on all counts. Then back to our villa with friends and family for well earned drinks, food, and a very bracing swim. So, just 8 weeks to go till the London Marathon. So, how are things going? A good week, I think. During the week, some hill intervals on the treadmill, a good paced 10km, some speed intervals, a swim and a good cycle. Then on Saturday I took the car to Melton and then the train into Ipswich, followed by a slightly looping 25km back to Melton, my longest run yet. It was a cold morning so I was kitted out in tracksuit bottoms, my warm winter top, a fluorescent top over that, my warmest gel gloves, and a fleecy hat, plus my Camelbak for water and to carry fuel. Possibly the most I’ve ever worn for a run. There was a good deal of suburbia but I enjoyed the docks/marina at Ipswich, several parks, the minor thrill of finding a pavement added to a road since the Google Streetview car had been along, exploring some of the heathland at Martlesham Heath (most of it now being housing estate), running through woods, views of Martlesham Creek, a visit to bits of Woodbridge familiar from over 26 years ago, into Melton, round the back along some rural footpaths, a train leaping out at me from behind a tree, and finishing by the River Deben. I also practised fuelling strategy, taking on Lucozade Sport drink that’ll be at the marathon (note: do not get this in your eye, it stings like hell) and for the first time a Lucozade Sport gel (much sweeter than the Sport in Science ones I usually use, but acceptable). I also had my planned pre-marathon breakfast at about the right time, and no problems experienced. I even added to the reality of the occasion by waking up before 5am and being unable to get back to sleep. 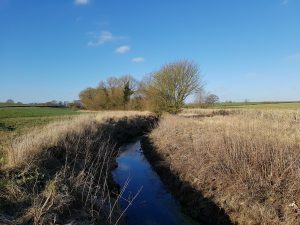 Sunday I went out to the headwaters of the River Gipping for a relatively gentle 11.5km recovery run, which went very well – no effects from the previous day’s long run. I’ve run personal record distances for each of the last three weeks, running over 59 km this week just gone, as well as nudging the longest run up a smidgen. However, 42.2km still seems like an awfully long way! Work still to do. 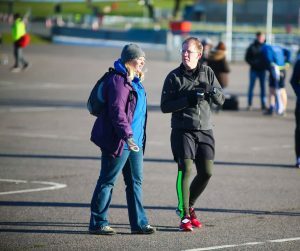 Today was Claire’s 50th parkrun, and someone who bear’s his share of the responsibility for Claire doing parkruns (and 10k’s and 10-milers) at all, I thought I would pop down to Hadleigh to help celebrate. 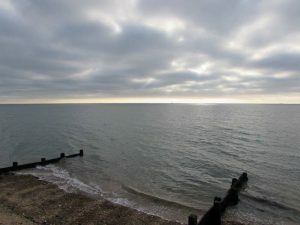 It was a glorious morning albeit rather chilly, with lovely views across the Thames estuary. Claire was tailwalking with her Dad, dragging her “50” balloons with her, while I pushed myself hard, trying to get the pacing right – in round terms, the first third is downhill, the middle third is gently undulating, and the final third is a fairly challenging uphill, so getting the pacing right is not easy. 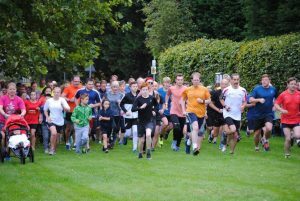 The analysis on Radio 4’s ‘More or Less’ recently suggested that by some measures this may be the hardest parkrun in the country. Anyway, something went right today and I knocked 50 seconds off my course PB to finish in 25:25, not bad with 110m of ascent – my running calculator says it was the equivalent of a flat 5km PB, for what that’s worth. I then had another kilometre run to the car and back to fetch my barcode which I’d carelessly left there (you’d think I would have got the hang of this by now), and then twenty minutes or so of cheering people across the finish, before retiring to the café for a nice hot chocolate and chat. 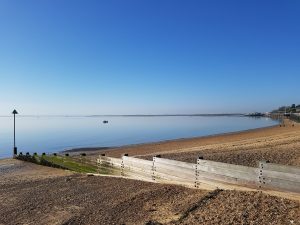 I then changed from trail to road shoes, popped down the hill to Chalkwell on the seafront, where the sea was almost completely flat, and set off for a run of indeterminate length – both 10km and 10 miles were in my head. My legs initially felt very heavy but after about 4km they seemed much happier and I kept going past the potential 5km turn-round mark. 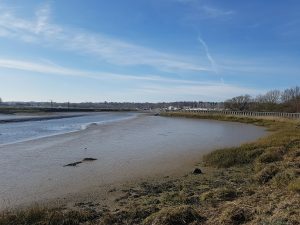 I still felt good at 8km so decided that it was a lovely day for a half-marathon and continued further past Shoebury Ness to the remaining MOD property. On the way back, the pier seemed to linger in the distance for a very long time without getting any closer, but it was good mental practice, increasingly so as my legs tired in the last couple of kilometres. Very happy with the morning’s running – albeit in three bits, the most running I’ve done in a day. 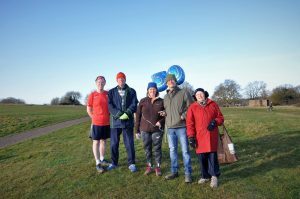 It was a chilly 1°C at the start of parkrun, and a warm 11° by the end of the long run. 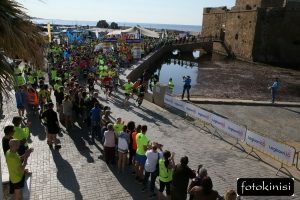 In March, my first overseas race, the Cyprus Half Marathon in Paphos. 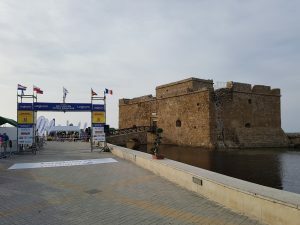 In places it’s not the most thrilling of routes, truth be told, but a great start and finish, and having spent so much time in Cyprus it will be fun to run a race there as part of the London Marathon build-up, 7 weeks out. 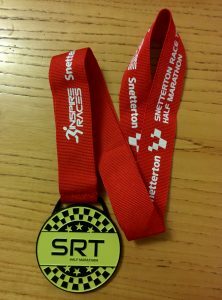 Other possibilities: the Stowmarket half-marathon in March is very local and a possibility, 5 weeks from London. The Tarpley 10 or 20 in February is also very local. However, none of these quite fit the distances my training plan is calling for, so I’ll reserve judgement for now. I’ve entered the London 10-mile in Richmond Park again in May 2018, having run the first one in 2017 and not done quite as well as I’d hoped. 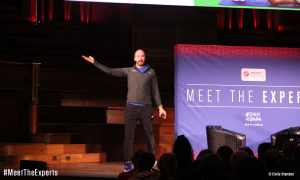 It’s only three weeks after the London Marathon, so I’m not sure whether that means I’ll be in peak form, or still gently recovering, or with a body just too focused on the endurance of the marathon distance rather than a bit more speed for 10 miles. We’ll see. And after that – no definite plans. 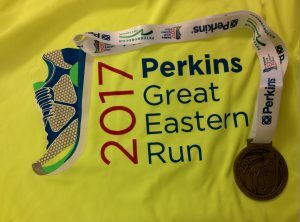 Perhaps the Perkins Great Eastern Half again in October. Definitely a 10k or two somewhere as that distance has been neglected with the marathon and half-marathon focus, and I think I now have more strength to succeed at 10k. And of course some more parkrun tourism, which has also suffered slightly. 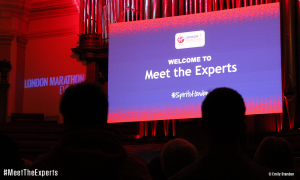 The organisers of the Virgin Money London Marathon put on an event called “Meet the Experts”, an opportunity to hear from a range of experts to help those attending (almost exclusively first timers such as myself) to be better prepared by the time we get to 22nd April, as well as entertaining and inspiring us with some noteworthy previous runners. I got a free ticket through my charity, Guide Dogs. I wasn’t sure it was going to be worth trekking into London, but it proved to be very worthwhile. Before the main session in the lecture hall, I had my feet measured for the first time in many, many years, and possibly the first time with such precision. My right foot is a 9.6 and my left a 10.4; my right is slightly wider than normal and my left about normal; my right is more arched than my left. I had my gait analysed, though with such a short runway, rather than a treadmill, I’m not sure how representative it was: the sponsors New Balance then tried to sell me new shoes based on their analysis, but nothing seemed quite right, and this close to the marathon it’s probably best to stick to what I know anyway. I already have four pairs of running shoes in action at the moment, which should be enough. 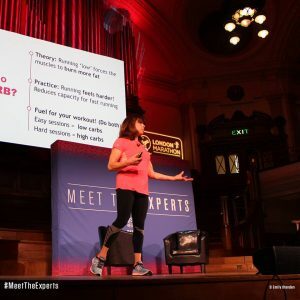 Lucozade Sport gels are at 14 and 21 miles – try Lucozade gels, as the combination of the Lucozade drink and gels would mean I would need hardly any gels of my own. In some ways I’d like to avoid having a running belt at all, but it is handy for phone, gels and handkerchief – and see point above about Lucozade Sport. Baggage lorries close at 0925. Only the official kitbag will be accepted, but I don’t know how big that is. 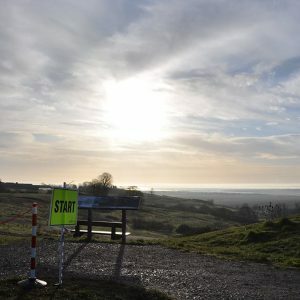 Get to the start in lots of time – allow time for baggage lorry and multiple visits to the loo! Discarded clothing at the start goes to charities – look out for something warm that we don’t mind losing, plus bin bag if any chance of rain or excessive wind. Wheelchair start is 0855, with para-athletes at 0900 and women’s elite race at 0915, so things for spectators to see before the men’s elite and mass race reaches them. The routes around the west side of Docklands which look as though they pass each other are actually on different levels, though still potentially provide opportunity for very short walk between viewing spots. Good spectator option is to start spectating near Canada Water (or Bermondsey), and then after I’ve passed, get Jubilee Line train to Canary Wharf, from where walk to where can see again (possibly even twice more). Trains will be very busy – be mentally prepared for queues and waiting. Then either to meeting area or to the Embankment – if the latter, don’t go too near Westminster as very busy. There are Runners World pacers – in 2017 at any rate, the relevant options for me would be 3h56, 4h15 and 4h30. At the moment I don’t have a target finish time (I have a range: 3h59 to 4h26). Unless I can get near one at the start, there’s little point, and there is a danger that I run too fast (or even too slow). Also, I don’t know which starting pen I will be in (I’ve no recollection of what I put as my estimated finish time) but I’d need to be in the same pen as the relevant pacer otherwise we’d be too widely separated. In next 76 days, get clearer idea of target pace – think in terms of target pace, not target finish time for now. Get my name printed on my t-shirt – find out how! Suggested to drink 400-800ml per hour. Five full Lucozade Sports is within that for four hours, so may not need much else if I get them all down me. When I tested myself, I found I lost 2.5l in a two hour half-marathon, so 5l in a marathon which suggests I should be drinking at the upper end of that range. The most common reason for people dropping out is drinking too much water. Only 500 people drop out – nearly 99% of people who start, finish. Around 500 people who collect their number etc. in the four days before the race, fail to start. I wonder why? I will be going from the Red Start. If I come in from Kent, as I’m currently planning to do, I will be able to walk from Blackheath if that looks the best train option, though Maze Hill and Greenwich are the official stations for the Red start – but there will be no barriers to prevent me walking through from Blackheath. Recovery food after long runs: fluid (milk, greek yoghurt, recovery drinks); carbs; high protein (for each meal during the day after the long run). Don’t start too fast. Don’t start too fast. Don’t start too fast. Don’t start too fast. Runners knee exercises – investigate exercises to strengthen appropriate muscles. Look at other strengthening exercises though experience to date suggests knee is most vulnerable and other common problems haven’t bothered me so far. My race preparation is well ahead of many people – keep positive. My 52nd parkrun location for this morning was an icy Druridge Bay, the most northerly parkrun in England while we were spending a weekend in Northumberland. While I was waiting in the cold and then running, Lucy took the dogs for a walk along the beach and found a couple of geocaches. The route is two (well, about 1.9) very attractive laps of the lake, with some gentle undulations, some in the woods and some more open. And in the frozen north it was my first parkrun in a hat. There were a few icy patches, but it was possible to find a route around them all without much difficulty. I’d intended to take it relatively easy, but once I got warmed up I found someone to chase (thank you Jilly Bell), and she pulled me round increasingly quickly so the second lap was 40 secs per km faster than the first (and didn’t need a hat). Good start to the day. A chilly morning (zero degrees when we set out from home) made for a slightly tricky decision on what to wear for this race, and as I stood around before the start, wearing an extra fleece and still cold, I began to doubt whether I was going to be wearing enough. The large number of women in vests and skimpy shorts (there were a few men similarly attired but we’re typically less hardy) suggested that either they were going to be even colder, or maybe I would be ok, though the several billion goosebumps in evidence didn’t set my mind at rest. The warm-up, though delayed because of late arrivals struggling to get to the course, eventually did its job, and once the race was underway I was fine. Later, I even contemplated throwing my gloves at Lucy who’d come to cheer me on. My top layer got increasing unzipped as the race went on. The course was three laps of Snetterton motor racing circuit plus an out-and-back along an access road, which meant six crossings of a bridge with a noticeable little climb. Even without the bridge six times, it wasn’t quite as flat as I’d been lead to expect: not hilly but enough gradient to notice. It was a beautifully sunny day, albeit with a fair breeze which increased and was noticeable everywhere on such an exposed route. A fair few supporters, and the looped route meant that I got a personal cheer eight times, which is always great. My objective was to beat, just, my PB from last month of 1:56:26. I was weakening slightly on the third lap, but reckoned I had just enough in hand to make it; however, my Garmin recorded me doing 21.2 km so the pace calculation was fractionally out, and at the water station on the third lap I had to wait several seconds for them to pour a drink as there was none ready, which I didn’t begrudge at the time but with hindsight was a bit frustrating since the end result was that my official time was 1:56:26. Couldn’t have done it if I’d tried. So, another medal to add to the collection, plus a bottle of water after the finish. No goody bag – they’re often a waste so probably no bad thing. The site had shower blocks which I took advantage of, and then after a quick snack we walked slowly along the access road, being passed by the tailenders, back to the car and so to the White Stag in Hingham for a late lunch. After doing my home parkrun last weekend, this morning’s exploration took me to Brundall, just east of Norwich for my 84th parkrun at my 51st different course. It’s a fairly new “countryside park”, and on the small side as these things go, so despite a route looping back on itself, it was still four laps of the park. All on grass, with some modest undulations. It was a dry morning: I had deliberately chosen to head NE from home to get further from the rain to the SW.
As at March parkrun a few weeks ago, I fell prey to the temptation of the 24-minute pacer, today Nicole, on a day when I wasn’t quite up to it. It was a very busy start but I managed to keep close to her, but after half a lap she pulled slightly away and I never quite managed to catch her, but kept her not far away and worked hard to keep close. I thought perhaps she was going a fraction faster than needed, but it turned out that she knew from experience that the course is slightly long and had adjusted her pace accordingly, so although I did manage to get 5km done in under 24 minutes, the parkrun finish line took 24:10 to reach. I thanked Nicole for pulling me round and making me run a bit harder than I would otherwise have done, and cheered a few people across the line. 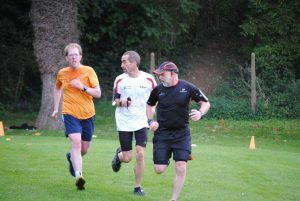 My 50th different parkrun location today was Castle Park parkrun, in Bishop’s Stortford in Hertfordshire. A very pleasant trot around the park with views of a second motte-and-bailey castle (after last week’s Clare Castle) and the infant River Stort, cheered on by a good few spectators including Lucy and two of our dogs, en route to a fabulous lunch with the in-laws. 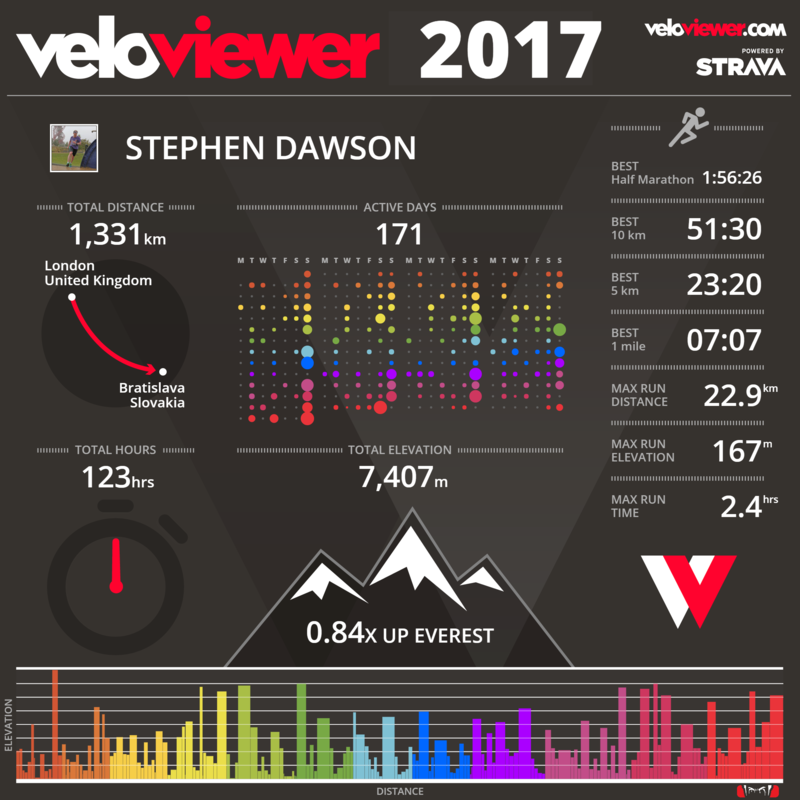 There was some tarmac but a lot of grass, some uneven and some quite squelchy and slow, so I was pleased with my time. Also as it was a very chilly morning, it was the first running outing for my London Marathon winter top: I had to half unzip it on the second lap as I was overheating, but it will be a good companion on the coldest of winter days. Clare Castle parkrun in SW Suffolk today for my parkrun tourism. It was just its fourth run, and so had been my nearest not visited. 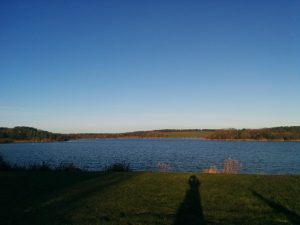 The run here allowed me to complete the Suffolk parkruns once again. 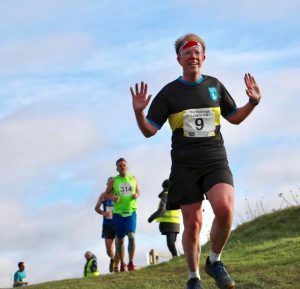 The route is around the country park, a spot I’ve been to a number of times, with the delightful site including the eponymous motte and bailey castle, as well as the former Clare railway station, and sits alongside the River Stour, with the parkrun crossing the river six times. It’s a varied route, a lot among trees, the majority on rough tarmac or concrete, but a fair bit that’s along the old railway line is on gravel/dirt/leaves, plus some grass. The slightly more challenging footing contributed to me being almost a minute slower than Southend last week. 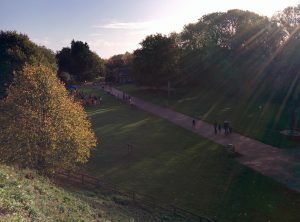 Afterwards I climbed up the motte to the castle, from where there was a grand view down onto the finish area. 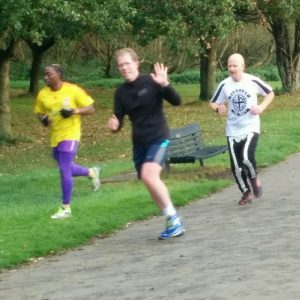 So, that was different parkrun location number 49 – I’m not sure whether number 50 is coming next week. 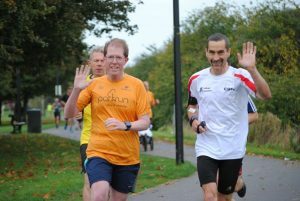 More parkrun tourism for me today: parkrun #80 at location #48 was Southend, joining a couple of friends, one of whom lives in nextdoor Leigh. 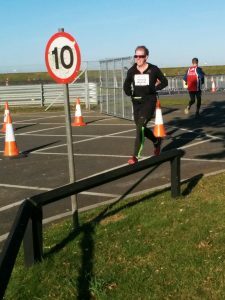 The course is very pleasant, being three laps of Gunners Park, itself part of a larger nature reserve formed from former military use as its name hints. It includes three laps of the lake and a section along the sea wall (see photo view). It’s almost flat and 95% on tarmac so despite slightly heavy legs from a cycle ride yesterday, and a bit of a breeze, I decided to go all out for a good time. I passed Claire part way through my third lap and she gave me a mental kick to push on hard to the end. Official time 23:24, knocking seven seconds off my parkrun PB so very pleased with that. I cheered in Bruno, and then jogged back nearly a km to find Claire to run in with her and to try to give her the mental support she’d given me. She got under 37 minutes for the first time, with the last km being the fastest, so great result for her too. Then the rest of the morning catching up with friends before trailing back to Suffolk. 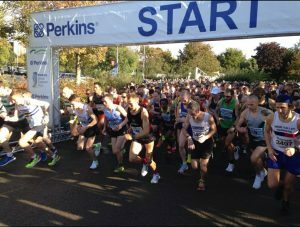 A beautiful day for a run today, the Great Eastern Run half-marathon around the streets of Peterborough. One or two people afterwards complained that it was hot and muggy, but they obviously weren’t in the same place as me – I thought it nearly ideal running conditions: blue skies to start with though more cloud later, about 12 degrees, and the gentlest of breezes. I recently read a Facebook post along the lines of “things I wished someone had told me before my first marathon” and one of them was the need to pee 19 times before the start. Well, I haven’t quite reached those heights, but after three visits at home, I stopped for another at the Peterborough motorway services which was full of runners with a side order of doggie people (the other group out and about this early on a Sunday morning), then got to the car park in Peterborough in good time. On arrival at the Embankment, I got in the queue for loo visit number five, then checked out the starting pens before rejoining the loo queues for visit number six. I guess it is nerves or excitement, but I can’t say I felt nervous, and while there was a general buzz of anticipation, I wasn’t unduly excited, either. I dropped off my bag and then returned to the starting pens. I was slightly uncertain about which was which: with one labelled “1:50” and another “2:00”, where should I go if I’m aiming at 1:59? I took the former to mean “1:50-something”, and found myself at the front. With the pacers for each pen near the back, I then found myself close to the 1:40 pacer as I crossed the start line, which felt odd. 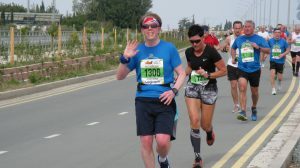 I felt reasonably well prepared for this one, having taken the running easy during the week, and rested fairly effectively yesterday, and with the weather being good and the course being fairly flat, I set off intending to run at my PB pace and see how it went. I adopted my increasingly familiar “jeffing” approach, running a mile and then walking for forty seconds. Knowing that there were water points at 3, 6, 9 and 11 miles, I flexed things slightly to make sure the water points coincided with walk breaks, which allowed me to take on water at a walk, which is much easier. I also took on gels at 2, 5, 8 and 10 miles. My aim for PB pace was 5:28/km for the mile-long runs, but in practice they came in at a very even 5:27 or 5:26 pace up to the half-way point, where I felt really good and pushed the pace just a fraction more, cut the walking sections down a smidgen, and found some further acceleration in the last two miles as the crowds grew thicker and noisier: I finally managed to pass the woman I’d been chasing since just before the half-way mark with just 200 metres to spare. My finish “sprint” was subdued but a definite speeding up to around 5:00/km for the last km, which saw me overtake quite a few other runners. My final time was 1:56:26, knocking 2:40 off my PB, so I was really very pleased with that. And while I worked hard, there was a bit more in the tank on the right day, so we’ll see how I do in 6 weeks’ time at Snetterton. 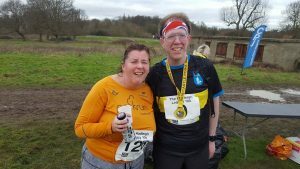 I then waited at the finish for fellow runner Marion from WeightLossResources who also had also run a great time, on her fourth HM in four weeks she’d run her fastest for two years – lovely to meet her and spend a few minutes chatting. A visit to March in Cambridgeshire this morning for parkrun #79 at my 47th location. 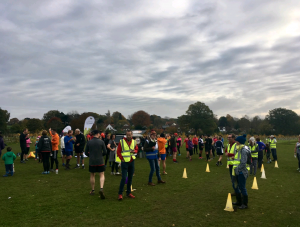 After a warm-up jog, I quickly got chatting to people – it rapidly became clear that it is a particularly friendly event with a lot of mutual support going on for the full range of abilities. 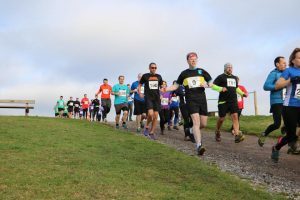 The route is four laps of the pleasant park: out and across the grass, back on a firmer surface alongside the old course of the River Nene (about four miles from the modern straight course), up the dozen or so stairs, down the grass slope and back to the start. I’ve had a few steps before, but this was my first parkrun with a flight of stairs. I’d planned to take it a little easier this morning, but I got caught up in the moment and ran with the 24-minute pacer. (They had 27 and 30, plus 1-minute-run-1-minute walk and 2-minute-run-1-minute-walk pacers too, the first time I’ve seen that – great idea.) It didn’t really feel like a sub-24 morning or course (I’ve run under 24 four times), and I had on my trail shoes which I don’t think are quite as fast, but I felt sorry for Clive who’d offered his services and didn’t seem to have any takers. We set off very briskly but soon steadied the pace. First lap was reported as 5 seconds ahead, which was fine, but I was already feeling that I was pushing too hard for this morning’s legs. After the next half-lap, we were 7 seconds ahead, so I eased up a bit along the river, and we finished bang on target. The third lap was hard, but we were 5 seconds ahead again by the end, but I was now really starting to wilt. On the fourth lap Clive (PB 21:21, ex-military and a personal trainer) really earned his keep, as did Hugh (PB 22:51) who’d by now joined him in pushing me round, cajoling, encouraging, and insisting that I persist, with some very emphatic pointing at the ground alongside them telling me to get myself there, to lift my legs, to lengthen my stride. So I pushed my weary legs on, feeling that I was definitely slowing down, but tried to power up the steps and then find anything left for the run for the finish. 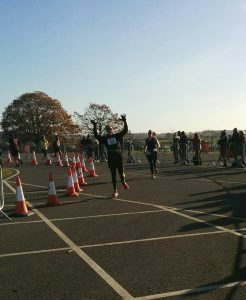 Final time 23:49 – very satisfying, and on more rested legs they would I’m sure have taken me close to my PB. I also found later that I was 18th of 153, my best relative position (11% through the field) yet. Good job Clive and Hugh. 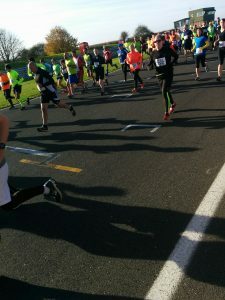 Once I’d got my breath back, I lingered to clap and cheer people over the finish line, said thank you to the run director and a few volunteers, and was on my way after a good outing for the legs.